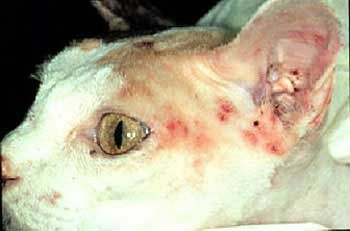 Animals from all walks of life are susceptible to contracting ringworm. There is one all natural solution that you should keep in your medicine cabinet at all times. Before we begin, I need to state that I am not a medical professional nor a doctor of any sort. I am merely sharing a remedy that worked for me. like the picture above. I've kept Tea Tree oil in our home for many years. Knowing from direct experience of the incredible skin healing ability of this oil, it was the first thing I grabbed when we discovered Sam's condition. Within two days of applying the oil three times a day to Sam's spots, they were gone without a trace! It was nothing short of miraculous, and we had one happy puppy again. The Key To Success Is To Start Treating Ringworm Immediately. If you don't treat it early enough, it can spread quickly and become very troublesome to deal with. unless you are in need of a proper diagnosis. Ringworm is fairly easy to identify (just do a google images search and you'll see what I mean), and it is also highly self-treatable. As the name suggests, ringworm is circular in nature. An individual will develop a red, scaley round lesion on the surface of the skin. Often, it will feel irritated and itchy. If found on the scalp (especially on children) it can cause bald spots. Left untreated, it can grow and spread across the body rather quickly. Ringworm is extraordinarily contagious. It can be contracted by skin touching skin or through a contaminated surface such as a blanket, workout equipment, and even soil. And yes, you can catch it from your dog! If not treated quickly, this adverse condition is liable to spread along the skin and even to others rapidly. Ringworm is extraordinarily contagious. It can be contracted by skin touching skin or through a contaminated surface such as a blanket, workout equipment, and even soil. There are countless ways tea tree oil can improve and cure certain skin ailments, to include, chicken pox, acne, psoriasis, cold sores, boils and irritations due to a staph infection, as well as ringworm. It is particularly useful in fighting various fungal infections. The oil comes from the leaves of the Australian tree/tall shrub melaleuca alternifolia (aka the tea tree). The Australian people have used this incredibly powerful antiseptic oil for more than 100 years! There are 200+ varying species of the tea tree located throughout the world (China, France, Guatemala, etc.). 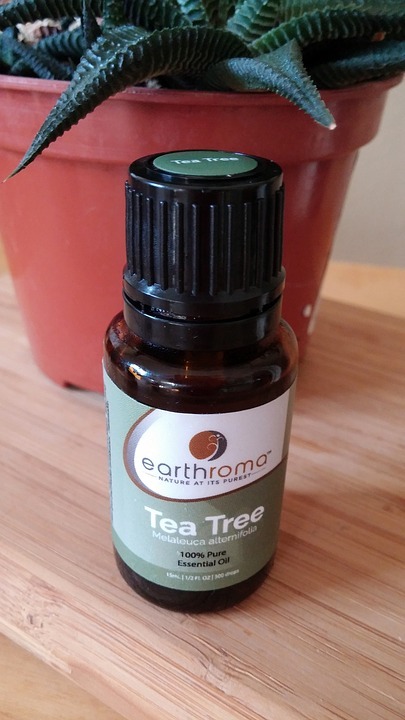 Tea tree oil can be easily purchased online via places such as; Amazon or locally at your nearest Walmart (in the vitamin and supplements aisle). Tea tree oil is relatively inexpensive and lasts a long time since very little is needed per application. Pour a capful or two of tea tree oil into a non-plastic bowl or container. Using a cotton swab, carefully dip one cotton end into the tea tree oil that you poured in the bowl. Next, you want to take the tea tree-saturated cotton end and begin gently swabbing the ringworm spot until you have completely covered the area with tea tree oil. Re-dip the cotton swab in the tea tree oil and apply to the remaining infected spots. (Optional) You may cover the treated areas with band-aids or gauze if you prefer. However, this step is not necessary for effectiveness. Apply three times a day (morning, midday, before bed), until the spots disappear completely. You should see results with the first two days. The moment you open the tea tree oil bottle, you will notice the unmistakable, over-powering odor it contains. Heed this warning, when using tea tree oil, if you get it on your hands, be sure to avoid contact with your eyes. Tea tree oil will create a burning sensation. If you accidentally make contact with your eyes, carefully wash your eyes with warm soapy water and pat dry with a towel, the burning sensation should subside. If the use of tea tree oil increases skin irritation, please discontinue use. Athlete's Foot medicated cream (as stated on the label) can also be used to treat ringworm, though may take longer to heal. Fungi thrive in moist, warm areas, such as locker rooms, tanning beds, swimming pools, and skin folds; accordingly, those that cause dermatophytosis may be spread by using exercise machines that have not been disinfected after use, or by sharing towels, clothing, or footwear, such as rental bowling shoes, ski boots, ice skates or roller skates. Avoid touching bald spots on animals. Cats and dogs are commonly known to carry the ringworm fungal condition. When using public bathrooms and shower facilities, be sure to wear shoes. Flip flops are a good choice. If you suspect that someone in your home has contracted ringworm; be sure to wash clothes thoroughly in hot water with fungicidal laundry soap. When working out or in locker rooms, be sure to avoid sharing things such as equipment, towels, or clothing. Ringworm can easily transfer through sweat, even sweat left behind on items.